DARA and AECID have just published a joint report on the 3-part Humanitarian Hardtalk series held in October and November 2013 in Madrid where leaders from three key humanitarian organisations (Valerie Amos, OCHA; Peter Maurer, ICRC; and Claus Sorensen, ECHO) discussed their views on humanitarian aid effectiveness. In humanitarian crises, such as Syria and the Sahel, the needs of affected populations far outweigh available resources and capacity to respond so it is not surprising that the effectiveness of aid is one of the most important challenges for the humanitarian sector. However, the idea of what effectiveness actually means is subject to debate. Defining, measuring and improving humanitarian effectiveness has been proposed as one of the main themes for the World Humanitarian Summit announced by the UN system for early 2016. How effective is humanitarian action in contexts where access and funds are limited? What does effectiveness actually mean given these limitations? 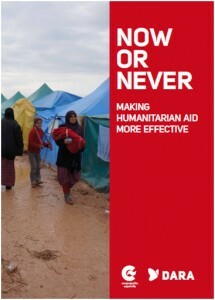 The report “Now or Never: Making Humanitarian Aid More Effective” covers the main points discussed during the three dialogues. The need for greater aid effectiveness- In many humanitarian crises, the needs of affected populations far outweigh available resources and capacity to respond. Maximising aid efforts is one of the most important challenges for the humanitarian sector. The elements of humanitarian aid effectiveness– Presence, coverage, respect for humanitarian principles, adherence to International Humanitarian Law (IHL), even and flexible funding, meaningful coordination, and pushing for development actors to take up their roles. Capacity in armed conflict- Progress in the capacity to deliver assistance in response to natural disasters has not been matched in conflict situations, where the effectiveness of the humanitarian sector is being increasingly questioned. Humanitarian Principles– Humanitarian response cannot be effective if it is not principles-based. Securing principled action is a responsibility of all humanitarian actors. International Humanitarian Law (IHL)- IHL provides rules to regulate humanitarian action in situations of armed conflict. It provides a highly relevant framework for negotiating humanitarian access with all parties to a conflict. Funding- The current system for defining need and consolidating appeals is considered dysfunctional, if not perverse, since there exists a habit of “piling up numbers” to rally political support. Diversity– The World Humanitarian Summit will need to contribute to defining a space that gives room to the many ways of delivering humanitarian assistance.